USB drives have many different business applications, and we use them daily to store or move data. Their versatility makes them a great way to distribute your marketing collateral, video, flipbooks and PowerPoint presentations. USBs are environment friendly, because they are an item that is kept and reused. 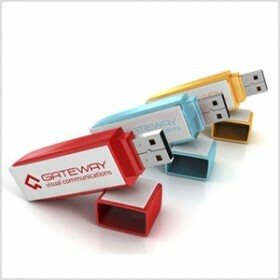 You can customize your USB drives with your logo and corporate colours, it is a great way to promote your brand. At GVC, we can design a custom icon, preload your data and add a gift box or lanyard.